MaxN-Fuze™ delivers important multivitamins, minerals, direct and indirect antioxidants to provide nutritional support for cellular function while supporting Max International’s glutathione enhancing products. MaxN-Fuze works by itself to refresh and revitalize while also working with other Max products to support the function of glutathione. Glutathione is the body’s master antioxidant, but it can’t protect your body from the ravaging effects of free radicals all by itself. That’s why we developed MaxN-Fuze—to fight against free radical damage and oxidative stress. 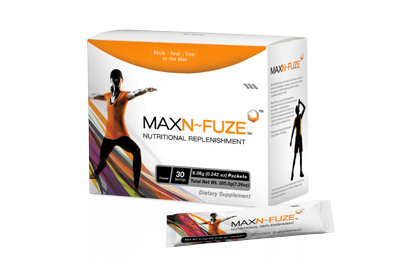 The MaxN-Fuze formula helps relieve the burden placed on glutathione by supporting other major antioxidant systems. MaxN-Fuze also provides a comprehensive array of vitamins and nutrients that contribute to improving overall health and well-being. “Direct” antioxidants, such as vitamin C and vitamin E, neutralize free radicals before they can harm cells. “Indirect” antioxidants, such as broccoli seed extract and green tea extract, do not neutralize free radicals directly, but actually trigger long lasting antioxidant activity by inducing antioxidant enzymes that help eliminate many types of free radicals. MaxN-Fuze is designed to deliver both direct and indirect antioxidants, as well as the nutrients and minerals to help support the important functions of the glutathione network. MaxN-Fuze is designed specifically to support other Max products by providing key vitamins, nutrients, and antioxidants that are known to support glutathione or induce enzymes that support glutathione. Uses the most highly concentrated form of sulforaphane glucosinolate (from broccoli seed extract), extracted to the highest standards.